It's not just for gene editing! A team of researchers from Harvard University have taken a look at the possibility that CRISPR may be used as a recording device. CRISPR/Cas9, the intracellular immune system common to bacteria as to humans, snips out pieces of DNA—called oligomers—from an attacking virus and incorporates it into its own genome, and later relies upon it as a historical database to combat the virus should it be encountered again. 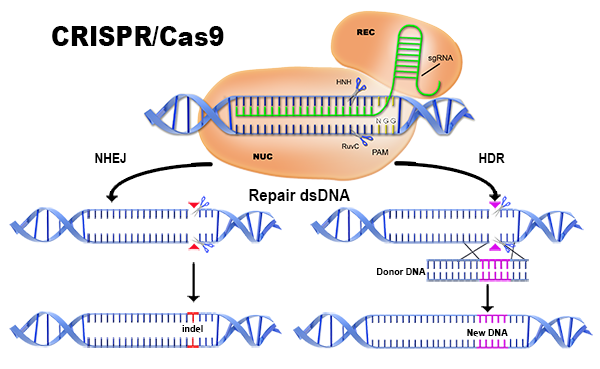 The CRISPR/Cas9 process. Credit: Advanced Analytical. The researchers noted that the oligomers are placed in the genome in the order of the viral attacks. Scientists need only sequence the genome for them to puzzle out the history of these attacks. They used a simplified form of E. coli, which still has the enzymes needed to perform the cutting and inserting of oligomers. Then, they exposed it to different DNA sequences. And they found out that their theory holds. The researchers are positive that the findings will be helpful in creating sensor-like bacteria that can compile a record of sorts, a kind of bacterial hard drive containing a history of infection or microbial encounters in certain environments—an ability that may be helpful in different fields.